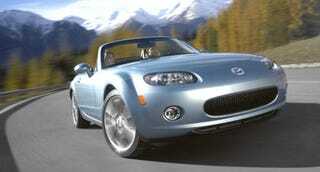 Autoblog reported this weekend Mazda's put the kibosh on rumors of a Mazdaspeed version of the MX-5. Speculation was rampant the turbo 2.3-liter Mazdaspeed3 engine would end up under the hood of the MX-5, but apparently the fuel pump design makes the swap from transverse to longitudinal mounting prohibitively expensive. So what's a forced-induction fan with an MX-5 to do?